Hit the 800 day streak on Elevate today. Between moving the phones and traveling, I lost the streak in June. So I used the cheat to restore the streak and never missed a day ever since. Here’s to 1000 days. Today I played Elevate for 600th day in a row. This is the only live and longest streak I currently have. Last night I broke 234 day long meditation streak in Calm.com. While it is unfortunate that I could not find even ten minutes to mediate yesterday, there is a bright side. I engrossed in something important and lost track of time. That’s mindfulness, isn’t it? By the time I realized, it was six minutes to twelve in the night. 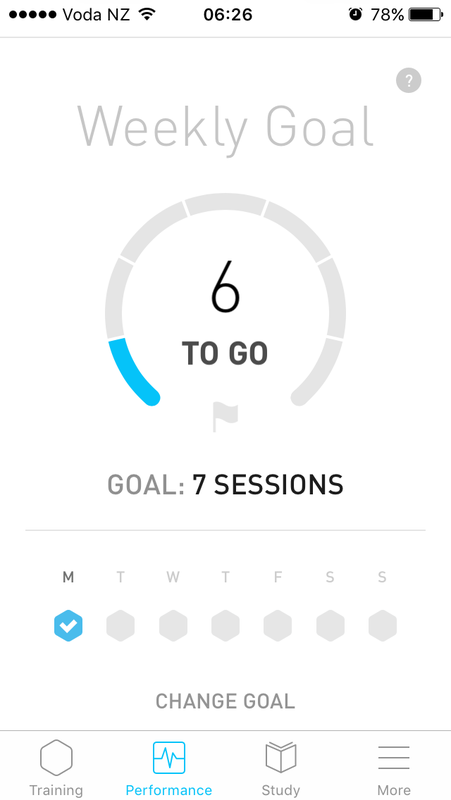 I could have meditated two minutes – my usual is ten minutes – just to keep the streak alive, but I saw no point. Although I need to start from square one, I think progress matters more than streak and perfection. So I am not feeling too bad. 2015 version of giving happened today. I am unsure when did 2014 version happen and if I blogged about it. But it surely happened sometime around this time in the last December. It is good to be giving a bit for three years in a row. It is a shame but I couldn’t touch type until recently. So this sounded like a perfect opportunity to put the deliberate practice theory to practice. 751 days of practicing as little as 20 minutes a day, I can now touch type. I am yet to practice numbers row but I mastered the other three rows. However, it wasn’t easy in the beginning. I struggled a lot while starting to learn. But I accepted that as a part of learning and put up patiently with each lesson. Every new lesson and new row was a struggle. Many a time, I used to practice the previous lesson or row just to get going and not give in. Eventually I mastered all the three rows and then moved on to copy practice lessons. Another thing that got me going was the feeling of mastering the keyboard. Deep inside me I felt very happy to be able to type without looking at the keyboard. One day I turned to my boss, pinged him in skype to look at me, and while smiling at him, I skyped and thanked him for nudging me to learn to touch type. He was impressed that I took his feedback positively and worked on it deliberately. I continued to practice even after I learned fully because I only needed fifteen minutes a day. I never missed a day of practice in the last 180 days. Now typing has become my new normal that I see no point in tracking this habit. So today is the last fifteen minutes of practice. I archived the habit in Lift and am not going to waste any more time tracking this habit. I anyway type a lot as part of my job and hobbies. My boss was not the first person to encourage me to learn touch typing. During the first year of college in the year 2000, one of my computer science professors encouraged our class to learn typing. I took his message and in the ensuing semester holidays, went to nearby town to learn typing on a mechanical type writer. I learned for about two weeks and eventually gave up and settled with two finger typing. Fifteen years later, I am glad I finally learned it. It is raining milestones this week. 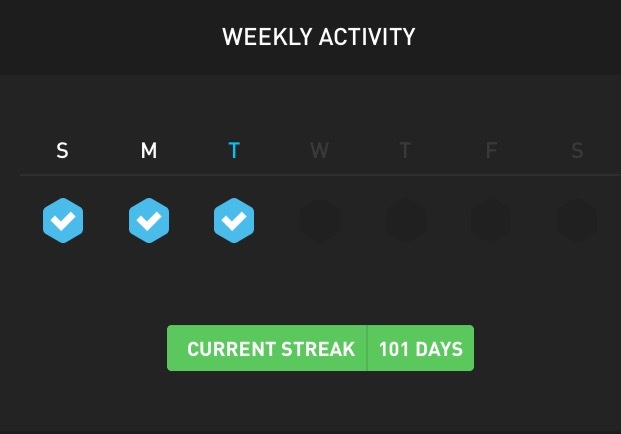 I hit 100 day streak in meditation. I started meditating this January but failed rather quickly. I say with experience that trying to start meditation with twenty-minute sessions is a sure shot way to stumble. So I started again in May with Calm app. I started with their beginner program and eventually realized ten minutes a day is more manageable. I have been regular since June. If I didn’t forget to look at Lift on that tiring day in July, my streak would have been 50% longer. Anyhow, I don’t wish things were different. I completed the third level of push up challenge with 37 push ups in a row. I struggled a bit to move past 35 but my trainer gave me some tips to move forward. The challenge is complete but the practice continues. All these tiny habits added up to 5000 check-ins since I discovered Lift in July 2013. I don’t like this app’s new name, Coach.me. Lift and Lifter sounds cooler than Coach.Me. So I will continue to call it Lift. Had I not read this post titled Two Tips for Deliberate Practice on Medium back in 2013, I would have missed this app and the Tiny Habits method it advocates. Reading can change life positively. As I can already squat 32 KGs and do 37 continuous push ups, I felt it would be great to round off this year with rounding off those numbers as well. So I aim to squat 40 KGs and do 50 push ups by end of 2015. It shouldn’t be difficult as I just need to continue the momentum. But it is easy to set goals than to actually do them. So fingers crossed. I finished exercising this afternoon and checked in to Coach.me to find this interesting milestone. It is indeed 211th check-in as I only started counting after the first eleven. 110 of those were in 2014. The rest 101 are in this year. This cheered up my otherwise regretful afternoon. I ate well up until lunch and then screwed it up. Between 1.30 p.m and 3.30 p.m., I had a medium-sized cookie, a small Kitkat, a small peanut butter cookie, and a small piece of cake. I did not pay for any of them except cookie. On a perfect day, I should have had only a fruit or two in the afternoon. I am generally eating well this year but am dropping ball once in a while, like today. It’s time to level up my eating. I know I can do better. I am also afraid that my less than ideal food habits are eating into my exercise gains. It takes a bit more discipline to eat exceptionally well. Nevertheless, I decided to move on and do well tomorrow. There’s a free cake coming my way tomorrow. I will stay clear of it. I have slowed down with my push-ups progress. I now reached to 35 in a row but stuck there for the past few days. I am trying hard to push through one or two more after 35 but it is proving difficult so far. I will keep trying.